Extreme rare antique Dutch gold filigree long pendent earrings: Description by Adin Antique Jewelry. 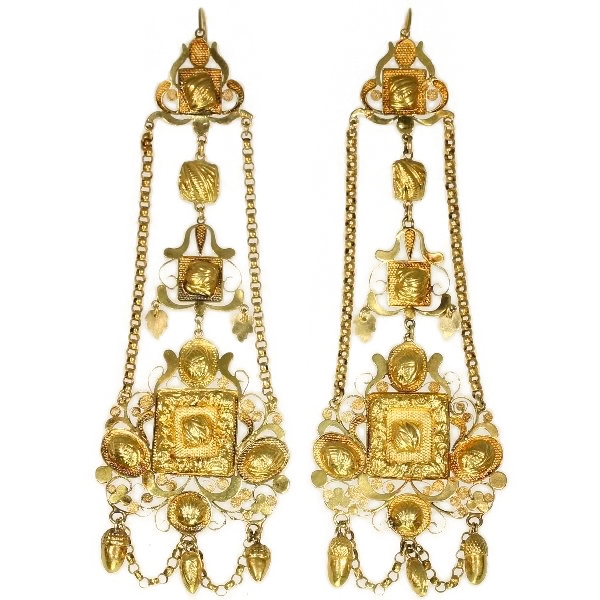 These rare 14K yellow gold chandelier earrings date from the Pre-Victorian era and are fully composed of filigree in a typical Dutch manner. A stylized lotus bud with its leafs reaching for an oval and guarding a square in its centre is connected to the grandiose bottom lotus with two cable chains on the outside and with a sequence of another square and a similar lotus in between. With reliefs of acorns, shells and leafs as embellishments of these earrings, they represent an ode to mother nature and her gifts to which we all should contribute even more today than in 1825. Hallmarks: master mark "I & ES", according to the Dutch essay office this hallmarked belonged to a goldsmith in the district of Rotterdam just around 1822. In the Second World War, Rotterdam was bombed and practically the entire archive was destroyed.